In the world of slots, luck is a very important element, the great victories are due in part to the fortune that accompanies you when you play. Microgaming has developed a slot with an Asian theme, where superstition and luck play a very important role. If you’re a fan of Chinese theme, with mysterious oriental environments, you will surely enjoy playing at Lucky Twins, a slightly mysterious slot, where the protagonists are some Asian twins that will give you the chance to win some bets. You have great potential to become a winner, as the gameplay of this slot is very good. 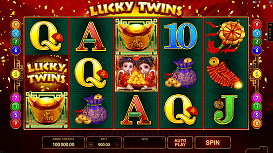 Microgaming has the habit of making publications with very creative themes, this time can play Lucky Twins, a very entertaining game that is related to the ancient culture of China, at all times can feel the strength of Asian traditions. The developers have done an excellent job in this game, known elements have engaged in this culture, combining good special effects and great music. This company has publications very successful, as “Terminator”, “Immortal Romance” and “Robo Jack” or the excellent adaptation of the film “Jurassic Park”, all with incredible success, this shows the high quality that is in each slot from Microgaming. This slot has 5 reels and is set in a 5×3 configuration, the symbols in this game are related to Asian culture and the traditional Q, K, J, A and 10. 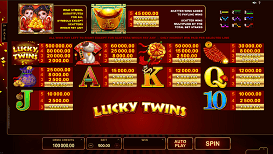 From the first time you press the “Spin” button the victories started to be generated on the reels, each symbol has an equivalence point, your goal is to get winning combinations on each of the 20 pay-lines that are included in Lucky Twins. In this slot you will find a Wild symbol and a Scatter symbol, the appearance of these symbols on the reels will help you build up some wins and generate large amounts of winnings to your balance. The Wild symbol is represented by the twins while the scatter symbol is the Golden Chest. The main feature of Lucky Twins are free spins, you can activate it if you get 3 Golden Chest symbols on the reels, this will be a great help if you want to increase your earnings during the bonus spins can get up to 10 in total. If you can get Wild symbols on the reels during the free spins round, they remain in place until the end of the bonus round, this means you can get a large sum of money if you get a large number of wild cards in this section game. The slot is equipped with 20 pay-lines where you can place bets ranging from 0.20 to 200, being the maximum possible credit for each bet. The percentage of RTP is between 95 % and 96 %, a high rate of return for fans who want to make the most money possible. If you get winning combinations, you can earn a maximum of up to 25,000 coins. This depends on the value of your bet and the emergence of the Wilds on the reels, remember that during the bonus round is when you can accumulate more money. The topics based on luck and superstition are usually very attractive to fans, in this particular game have included a lot of amulets and symbols that symbolize wealth and prosperity in the Asian culture, so the luck will be on the environment in each of the bets you make, this slot is full of nice graphics and excellent animations, you just have to press Spin and let the combinations begin to fill your balance with cash and prizes. If you are looking for tons of free spins and good luck, Lucky Twins will be one of your best choices this season, enjoy this slot full of Wilds, Scatters and bonuses.